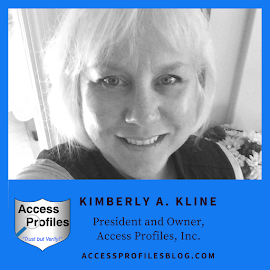 Access Profiles, Inc.: Online Background Checks ~ Do You Know Why You Need to Do More Before You Hire? 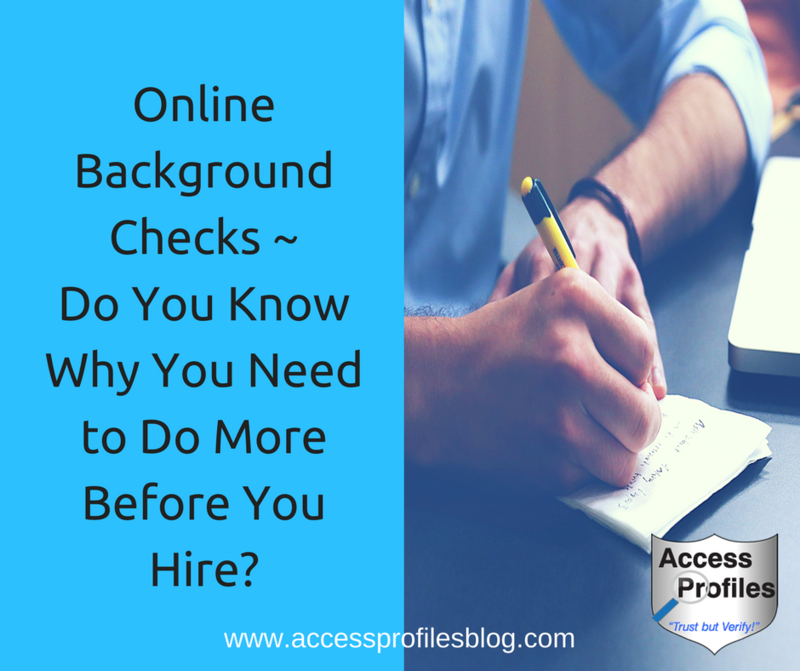 Online Background Checks ~ Do You Know Why You Need to Do More Before You Hire? We live in an “online world”. “Googling” someone or something is a daily occurrence for many of us ~ me included. And many times that is a good thing! I love being able to check out the lyrics of a song that is running through my head. Or find where my favorite shoes or jeans are on sale. Even checking out trending news stories is often part of my day. But that doesn’t mean that everything you find online is always true and accurate! That is especially important to remember when it comes to hiring for your business! I am sure you have seen the many ads touting how quick and easy it is to find out everything you need to know about any potential employee. They claim to offer a low cost and immediate solution to your background check needs. 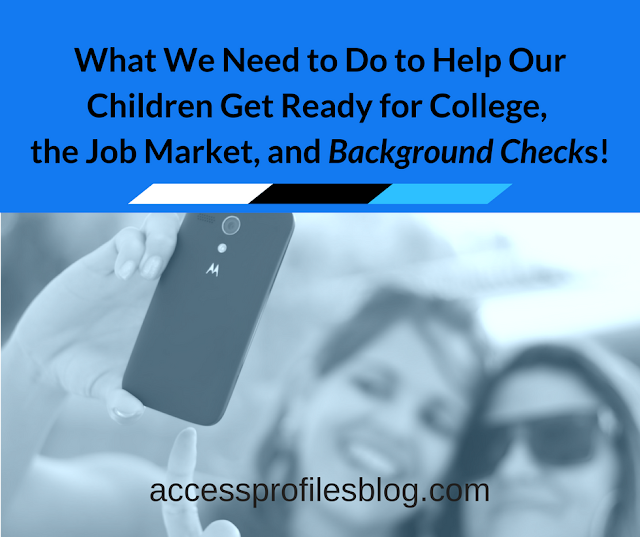 But is an online background check really as easy and helpful as it seems? 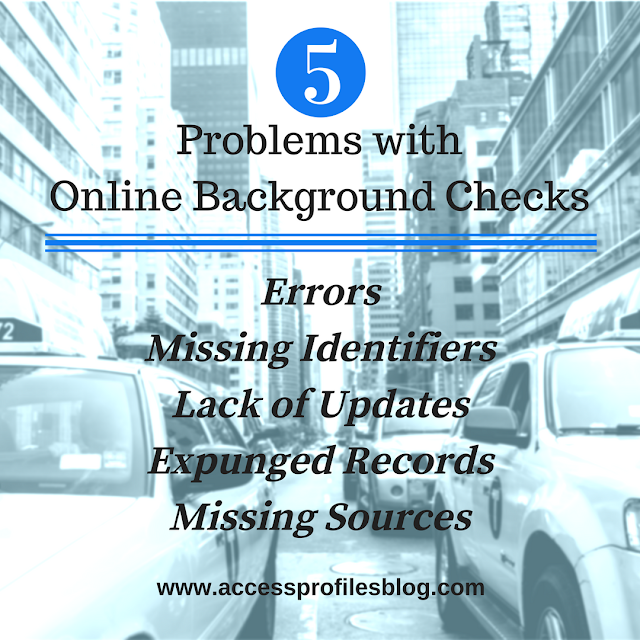 Online Background Checks Alone will Not Give You the Hiring Information You Need! Tweet This! Using an online database in your hiring process is simply not enough. That doesn’t mean it has no value, but it does mean that you need to do more. As with anything, there are both pros and cons to using an online database to do your employment background checks. The biggest ‘pro’ (in running a background check online) is speed and area of coverage. Being able to check multiple sources at once, and getting immediate results, has definite allure. This broad type of search will yield information that would not be found in a traditional, narrower, relevant court record check. And if you use the online information you find simply as a “jumping off” point, then it makes sense. But you can’t stop there. Taking the next step and verifying what you find online with the actual court is good business and the right thing to do. There are also “cons” to using an online background check, and errors top the list. Inaccurate records and, more importantly, missing records can cause you to deny or grant employment without all the facts. The tendency to think that an online check covers every existing court (think “national” background check) is also a misconception ~ and can give you a false sense of security. The fact is that there is no one source that covers all the local, county, state, and federal courts. Read more about errors and omissions in online searches in “Background Checks and Online Databases - What You Need to Know”! But errors are only the beginning. There are other problems with relying on online database information to make your hiring decisions. Some database records might be found under “name only”. These cases do not include other identifiers that would help you determine whether they apply to your subject. A missing date of birth, address, social security number, or other information that can cause you to include or exclude a case as belonging to your applicant is a problem. Often times database records are not updated in a reasonable amount of time, or not at all. Arrest records that are not updated to include the case disposition. Cases where the subject was given probation and /or the probation is revoked or continued. Records where the sentence was listed as “Not Final” that are never updated. These cases can occur when a subject is offered a final disposition of Not Guilty pursuant to a successful completion of court mandated ARD or other rehabilitation programs. Legally expunged records where the database has not removed the record or included the granted expungement (see below). In all these cases, and others like them, you may be basing your hiring decision on incomplete or even incorrect information. Expunged records are often not removed from online databases. When a record is expunged, it is legally as if the crime never occurred. In fact, an applicant that has been granted an expungement is within their rights to state they have never been convicted of a crime. If a record is found in an online database that has subsequently been expunged, you may be basing your hiring decision on information that should be excluded. This is a problem for both you and your applicant. Learn more about Expungements in “Expunging Criminal Records ~ What You Need to Know”! Knowing the source of any online information is important. Was it obtained from an actual court search? If so, which court? If not, where was it found? This information is crucial in helping you do the necessary follow up research. You must determine that the information found is accurate and updated, and without the source, it is much more difficult. means going beyond what you find online. when choosing your new employee. accurate and cost effective information you need to hire for your business!